Long Island Rail Road riders were mired in yet another commute nightmare during both the morning and evening rush hours Tuesday, and one frustrated passenger let loose on an employee amid the transit mess, video shows. The first set of problems began when an empty train derailed at the Long Beach yard early Tuesday morning, crippling service on the line. Then hours later, as the evening rush was winding down at around 7 p.m., separate signal problems east of the Jamaica station caused widespread delays across LIRR. The LIRR Twitter account warned riders to expect changes in service out of Penn Station and Jamaica. Delays averaged about 20 to 30 minutes systemwide, the LIRR website said. Normal service resumed by late Tuesday night. 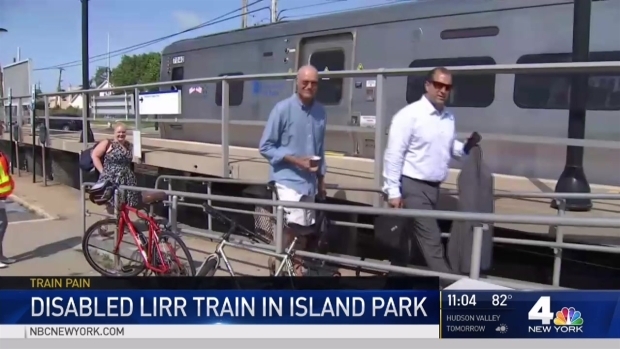 Though the LIRR website initially said all lines were seeing "good service," commuters began tweeting about being stuck on trains or lengthy waits at stations. Many at Penn Station said the boards were blacked out for nearly all branches. The frustration was apparent at Jamaica Station, where one passenger was seen screaming at a LIRR worker inside a booth. LIRR riders caught in the Penn Station delays had just disembarked at Jamaica to hear a last-call announcement for the 7 p.m. Oyster Bay train. They ran to the platform and rushed to catch the train only to have the doors close on them, according to the News 4 reporter who captured the exchange. A frustrated passenger is captured screaming at a LIRR worker inside a booth at Jamaica Station Tuesday evening. Riders caught in the Penn Station delays had just disembarked at Jamaica to hear a last-call announcement for an Oyster Bay train. They ran to the platform and rushed to catch the train only to have the doors close on them -- and that's when the tirade started. Read more here. "Open the [expletive] thing, come on!" the angry passenger yells. "You got your salary, your benefits, your 401K and you [expletive] us all day! [Expletive] all of you!" The rant was reminiscent of a Mets fan who railed against NJ Transit when train trouble made him late to a game. 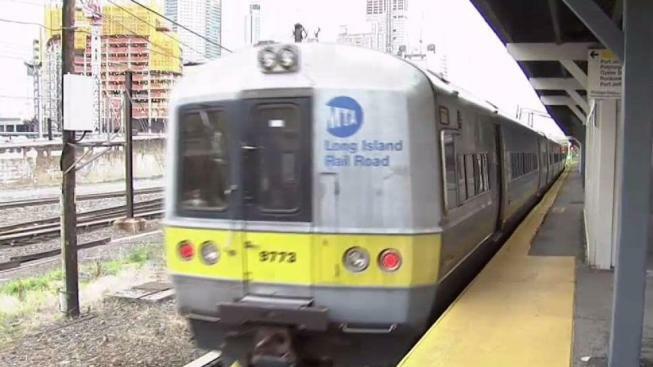 Earlier Tuesday, a non-passenger train partially derailed at the Long Island Rail Road's Long Beach yard, prompting a brief suspension and, later, limited service that stretched into the late morning, MTA Chairman Joe Lhota said. Lhota said no one was hurt when two cars of the train came off the tracks as it was moving from one end of the yard to the other around 5:15 a.m. It was moving slowly, about 5 mph, and once the engineer realized something was wrong he stopped moving immediately to avoid switch or other damage. Service was suspended for about an hour, then limited service every half hour resumed between Island Park and Jamaica. Buses replaced trains between Long Beach and Island Park in both directions, and Lhota hailed the LIRR's swift response to get riders alternatives. Regular service resumed by late afternoon, and officials promised a normal evening rush. The wheels on a LIRR train became 'misaligned with the track' Tuesday, causing disruptions to the rail service. Greg Cergol reports. Chopper 4 over the scene showed crews surrounding two of the train cars, which appeared crossed over the track. Lhota said a crane was being brought in to help remove the train, at which point the MTA could assess possible damage. The headache Tuesday came a day after a trash fire spread to the tracks at the 145th Street subway station, crippling the morning commute for tens of thousands of riders. Lhota said the transit agency has worked hard over the years to minimize the number of track fires, and asked straphangers to be mindful of tossing their trash into receptacles on the platforms. Lhota said the MTA is also bringing in new equipment to enhance track cleaning efforts. Major repair work at Penn Station is now in its second week. It's forced LIRR and NJ Transit to cut back schedules at the nation's busiest train station. The work is to go through the end of August, and Amtrak called the first week of repairs a success, with no major hiccups.